A special award and two promotions were the highlight on the April Wing Staff Meeting. Col. Roy Douglass presented a Commander’s Commendation to Lt. Col Dan Ellis for his many years of devoted service to CAP and the NC Wing. Most recently, Lt. Col Ellis had served as Group Three Commander. Geographically, Group Three is the largest group in the wing. 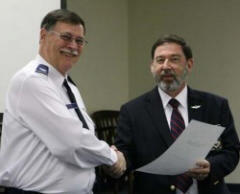 Col. Douglass also presented retirement papers to Lt. Col Ellis. Included with his official retirement, he also received a letter of thanks from CAP Commander, Maj. Gen. Amy Courter. Col. Douglass, assisted by NC Wing Chief of Staff, Maj. John Kay, formalized the promotions of 1st Lt. Mario Capobianco and 1st Lt. Jim Thomasson to the rank of Captain. Prior to the meeting, wing staff members were given copies of the result of a lengthy study undertaken By Maj. Kay. Both Kay and Col. Douglass explained the new NC Wing Report List. The report is believed to be an all-inclusive summary of the many reports due from the various staff and unit members. This report covers all of the major functions within the wing and the specific reports that are required and also cites the regulation requiring each report. Lt. Col. Dave Crawford, NC Wing operations director announced that, as of March 31, 2010, the NC Wing is in third place nationally for aircraft utilization, on average of 120 hours per aircraft.